Ex-Man United favourite Cristiano Ronaldo can now look forward to an Old Trafford return with Juventus. 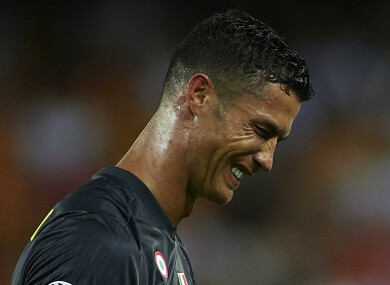 CRISTIANO RONALDO WILL serve a one-match Champions League ban for his red card in Juventus’ 2-0 win at Valencia, with Uefa’s decision not to hand down a more excessive punishment clearing him to face former club Manchester United. The five-time Ballon d’Or winner was controversially dismissed following a clash with Jeison Murillo at Mestalla, although Juve went on to triumph through penalties from Miralem Pjanic either side of half-time. Ronaldo will sit out Juve’s match against Swiss champions Young Boys but the decision from Uefa’s Control, Ethics and Disciplinary Body means the ex-United favourite will be able to make his latest return to Old Trafford on 23 October. Email “Ronaldo free to face United at Old Trafford after receiving only one-match ban”. Feedback on “Ronaldo free to face United at Old Trafford after receiving only one-match ban”.